“May Your unfailing love be my comfort, according to Your promise.” Psalm 119:76 NIV. Comfort expresses God’s character even more than describes His compassion. 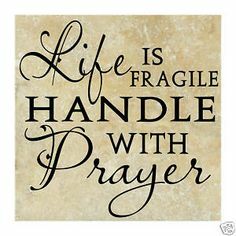 There are times when life should come with a warning, “Fragile, handle with prayer.” Life can be painful; people can be fragile. Life will hold its share of bumps and bruises. When your heart is breaking, when difficulties multiply, when problems overwhelm, when you think you cannot make another day, you can know and trust the God of all comfort. God always handles people with care. You or someone near you needs God’s comfort today. If you have seen a mother comfort a sick or fussy child, or a father gather a frightened toddler into his arms, you were watching God at work. Nothing comforts a child like its mother’s arms, held close to her heart, and hearing her familiar, comforting voice. The crying stops and the child settles, resting quietly and safely in familiar arms. That’s a practical and tender picture of what God does for any child of His. God comforts them. I have watched elderly saints struggling with pain that no medication seems to ease until God invisibly takes them in His arms and whispers His words of peace and assurance. I have witnessed families gathering at a graveside where hearts are aching and tears flow, until God touches broken hearts and they begin to heal. Remember, “The eternal God is your refuge, and His everlasting arms are under you.” Deuteronomy 33:27 NLT. Jesus said, “I will pray to the Father and He shall give you another Comforter, that He may abide with you forever . . the Comforter, which is the Holy Spirit, whom the Father will send in My name.” John 14:16-17/26. The word is also translated, “helper, counselor, encourager.” Comfort expresses God’s character even more than describes His compassion. Run quickly to, “the Father of all compassion and the God of all comfort, who comforts us in all our trouble so that we can comfort those in any trouble with the comfort we ourselves have received from God. For just as the sufferings of Christ flow over into our lives, so also through Christ our comfort overflows.“ 2 Corinthians 1:3-5 NIV. His comfort to you is to overflow to others. “May our Lord Jesus Christ and God our Father, Who loved us and in His special favor gave us everlasting comfort and good hope, comfort your hearts and give you strength in every good thing you do and say.” 2 Thessalonians 2:16-17 NLT. God’s heals your hurt to empower you to bring healing to others. A simple prayer, word of encouragement, or expression of practical care can be an immeasurable comfort to others. Today, I pray for you to experience God’s loving care and healing comfort. Dear Readers of EDL: I will be taking a few days of leisure with my wife and some dear friends, away from my office and writing responsibilities. In these next days, visit the Archives of previous devotionals at the Wedbiste, if you need a bit of God’s Word to brighten your day and lighten your heart. I so appreciate your partnership in EveryDay Life. I’ll meet you here again next week. Blessings In His Name. “A merry heart is good medicine.” Proverbs 17:22 NIV. Laughter is a gift you give yourself and others. When humor is good-natured and without sarcasm or portraying others disparagingly, it can provide a mental and emotional mini-vacation that lightens and lifts a heavy heart. “Laugh and the world laughs with you; weep and you weep alone.” (Solitude, Ella Wheeler Wilcox, 1850-1919, American author and poet). People don’t laugh enough and they, as well as their family and friends, are the worse for the lack thereof. A common saying is: “Laughter is the best medicine.” Solomon was the wisest of men, and he wrote that “Being cheerful keeps you healthy. It is slow death to be gloomy all the time.” Proverbs 17:22 TEV. Lighten up; brighten yours and others’ lives. “A merry heart makes a cheerful countenance, but by sorrow of the heart the spirit is broken.” Proverbs 15:13 NKJV. Laughter is healing to the soul. 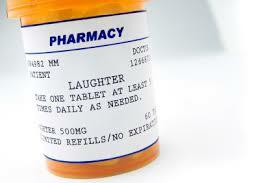 Humor freshens attitudes, refreshes emotions, relieves worry, and releases tension. Solomon was the wisest of men, and he wrote that “Being cheerful keeps you healthy. It is slow death to be gloomy all the time.” Proverbs 17:22 TEV. As I was growing up, our home was a happy place. Our family laughed freely and frequently. My Dad had a big smile and a ready laugh. When friends were in our home, I remember that there was lots of laughter and funny stories. Solomon wrote, “For the happy heart, life is a continual feast.” Proverbs 15:15 NLT. A favorite childhood memory of mine is sitting by my Dad watching comedians on television, laughing together at the antics of Red Skelton, Milton Berle, or George Burns and Gracie Allen. Admittedly, that was before comedians considered profanity and vulgarity to be funny. My Mom was always my most appreciative audience. I enjoyed making her laugh. None too seriously, my Dad would occasionally say, “Don’t laugh at the boy, Mildred; you’ll just encourage him!” Apparently, she ignored his pretended discouragement. I still love a well-placed humorous ad-lib, probably more than continues to be funny sometimes. I love laughter that is joyous and spontaneous. Does that happen to you often enough? Laughter is a gift you give yourself and others. Do your friends and family a favor; make them laugh. My Dad also said, “Everyone brings joy, some when they come and others when they go.” Be the first of those; bring joy whenever and wherever you come. People don’t laugh enough, especially at themselves. Don’t take yourself and everyone else so seriously. 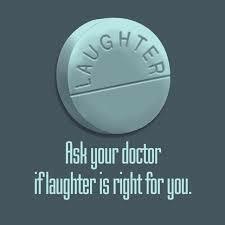 When things are as serious and sobering as our world seems to be presently, a few more people with a healthy sense of humor does not seem to me a bad thing, especially ones able to laugh at themselves. Jesus must have had a terrific sense of humor, judging by the stories He told. Imagine a camel trying to go through the eye of a needle (Matthew 19:24 NIV), or a judgmental person trying to get a speck out a friend’s eye with a sizable log in their own (Matthew 7:1-5 NLT). Read the Gospels. People loved being with Jesus; children and crowds sought His company. I think everybody was happier being with Jesus, except those who thought themselves too religious or self-important. I envision Jesus with the broadest of smiles, most uninhibited laugh, and the most joyous of hearts – all the while loving life and living abundantly. His desire for you is simple and clear, “These things I have spoken to you, that My joy may remain in you, and your joy may be full.” John 15:11 NKJV. The world – and the Church – needs a lot more of His joy. Today, I pray for you to have and enjoy the company of friends who find humor healing. “May the Lord of peace Himself give you peace at all times and in every way.” 2 Thessalonians 3:16 NIV. Peace is the crowning presence of God in and around your life. Peace is priceless. Peace with God, peace with others, and peace of heart and mind are beyond price. A Scottish friend of mine often used an Old English word, “dispeace,” by which he described an unsettling lack of peace in one’s heart and mind. The Bible refers to peace with God, peace from God, and the peace of God. Peace first begins with a heart that is right before God. The Psalmist wrote, “Mark the blameless man, and observe the upright; for the future of that man is peace.” Psalm 37:37 NKJV. Similarly, Paul write in the New Testament, “Therefore, there is now no condemnation for those who are in Christ Jesus.” Read Romans 8:1-4 NIV. Peace is never about what is absent. Peace is always about what is ever present, God’s Word and character. From years earlier when I was a young pastor, I remember a story my Dad told that clarified Biblical understanding of peace for me. A wealthy individual offered a worthy sum to any artist who could best portray on canvas the concept of peace. 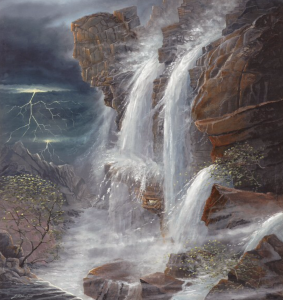 Numerous, beautiful oil paintings of a variety of tranquil scenes were submitted for the competition. Among those was the most beautiful painting in which the artist had masterfully pictured a placid, flowing stream across a verdant meadow, blue skies above, and a backdrop of contentedly grazing wildlife and livestock with sunbathed, majestic hills in the distance. The last picture to be judged was a rugged coastline with crashing waves beneath stormy skies with harsh winds and driving rains. Hardly anyone noticed the artist had painted the tiniest nest high above the pounding waves, where sheltered from the winds in the upper reaches of the rugged cliffs was a small bird serene, undisturbed, and at rest. The title was one word, “Peace.” Peace is much more than the absence of disturbance. Peace is the crowning presence of God in and around your life in every circumstance. As a pastor, I have seen many people in the midst of terrible difficulty who displayed inexplicable peace. I am writing my thoughts today after a phone call from longtime friends, a mother and son mourning the tragic, accidental death of their younger son and brother. I expected to encourage them but in their words and tears I heard their peace and rest in God’s faithful, loving care in spite of their present pain. “You will keep in perfect peace him whose mind is steadfast, because he trusts in You.” Isaiah 26:3 NIV. Perfect peace. In that verse, the only requirements for His peace are yours and my steadfast mind and unwavering trust. Develop an unwavering trust. The most common greeting of the Apostle Paul in his letters to the New Testament churches was always, “Grace and peace to you from God our Father and from the Lord Jesus Christ.” Romans 1:7 NIV. Because of grace we are given transcending peace. “And the peace of God, which transcends all understanding, will guard your hearts and your minds in Christ Jesus.” Philippians 4:7 NIV. Today, I pray for you that mercy, peace and love be yours in abundance. Jude 2 NIV. “Your sincere faith, which first lived in your grandmother and mother.” 2 Timothy 1:5 NIV. Faith must be sacredly held, sincerely lived, and successfully shared. Everyone has influence. The impact of some is beneficial; the effect of others is less so. Nowhere is there the greater opportunity for enduring influence than in the home. Since this weekend is Mother’s Day, let me share some thoughts about moms. 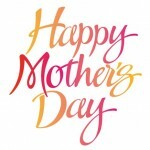 Certainly, in the home and family they are not the only influence; but for this occasion, Moms deserve the spotlight. Knowing me, God knew I would need a Mom that was especially patient, generous to a fault, immeasurably kind, and extravagantly loving. My Mom – Mildred Florence (McGinness) Randolph – was exactly that kind of Mom, and more. She was the eldest of thirteen children, the daughter of a pastor, and an exceptional pianist. She was raised in a very modest home. My grandad always worked to support his family in addition to what the small churches of southern Illinois could provide in the 1930s and 40s. They were poor in comparison with others but rich in the things that truly matter – family, love, character, loyalty, and faith in God. They never thought of themselves as poor; they considered themselves fortunate. My Mom was raised in a Christian home. My Dad had not even been inside a church until he was seventeen. His personal conversion resulted from my grandmother’s miraculous healing, when he was a teen. My Dad, a young Bible School graduate from Buffalo, New York, held a revival in southern Illinois and discovered this pastor’s beautiful and talented daughter playing the piano. Soon she was his wife, and then she was my Mom. For that, I am graced and blessed. My Dad died a young man, just 44 years old. My Mom died about 15 years ago at the age of 80. Even long after their deaths, my parents and grandparents still influence my personal faith. My parents were both significant, spiritual influences in my life, shaping who I am as a man, husband, father, and minister. Church and home were one and the same in our family. My Dad from his pulpit and my Mom from her piano, taught me the inestimable worth of a personal knowledge of God and a life of faith and service. Every day of my life has been blessed by their words and personal example. Our marriage, ministry, and family of four generations have a Godly heritage that could not have been earned or learned in a lifetime without them. Read 1 Peter 1:3-5 NAS. My Dad taught me the rare value of faith and friendship, and the loyalty and integrity required in those. My Mom taught me a generosity and care for others that I am far from having mastered yet. My parents left me an inheritance counted in the very real currency of the lives and faith of our children, grandchildren, and great grandchildren. “A good man [or woman] leaves an inheritance to their children’s children.” Proverbs 13:22 NAS. You will afford your family a Godly example or allow them a perilous exemption. Sincere faith must be sacredly held, sincerely lived, and successfully shared with the next generations. Make your practice and profession of faith honest, and especially, consistent. A Godly, family heritage that touches future generations can either continue or begin with you today. Today, I pray for you to highly value the faith entrusted to you. 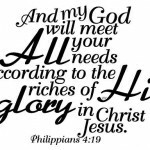 “My God shall supply all your need according to His riches.” Philippians 4:19 NKJV. What God withholds, you are best without. We all have needs and wants. Our difficulty is distinguishing between those; our insistence on satisfying both makes those feel ambiguously similar. God has promised to supply your needs. “And My God shall supply all your need according to His riches in glory by Christ Jesus . . Let us therefore come boldly to the throne of grace, that we may obtain mercy and find grace to help in time of need.” Philippians 4:19/Hebrews 4:16 NKJV. Sometimes, your wants incorrectly masquerade as needs. But God never promised to provide all you want; wants are forever changing, and many times could be unwise for you. With your wants, you must trust God to know and choose what is best for you. I have heard it said, “It never hurts to ask.” With God, there is no constraint about your asking. In the context of persistence in prayer, Jesus encouraged, “Ask and it will be given to you; seek and you will find; knock and the door will be opened to you. For everyone who asks receives; he who seeks finds; and to him who knocks, the door will be opened.” Luke 11:9-10 NIV. Read Luke 11:5-13 NLT. “You do not have, because you do not ask God.” James 4:2 NIV. How sad it would be if your needs were not met merely because you didn’t bother to ask God. Beyond the fact that God relates His generosity to your request, asking is a healthy expression of humility as well as an honest confession of reliance upon God rather than yourself. But be advised; God’s promises are not blank checks you can fill in and cash whenever you want. The Bible is clear about times when God does not respond to your requests as you wish. In fact, James also addressed times when you ask but God does not provide, “When you ask, you do not receive, because you ask with wrong motives, that you may spend what you get on your pleasures.” James 4:2-3 NIV. What God withholds, you are best without. God is both loving and wise, a Father who delights to meet your needs, and more. But He is not a doting Father who gives you what you want rather than what is best for you. Having God’s attention is not complicated. “This is the confidence we have in approaching God: that if we ask anything according to His will, He hears us. And if we know that He hears us – whatever we ask – we know that we have what we asked of Him.” 1 John 5:14-15 NIV. God’s liberality is forever aligned with His will. “If you abide in Me, and My words abide in you, you will ask what you desire, and it shall be done for you.” John 15:7 NKJV. Soak your heart and spirit in the Word of God. In addition to being persuaded of the will of God, Jesus said, “If you believe, you will receive whatever you ask for in prayer.” Matthew 21:22 NIV. Believe that what God wills to do, He will do. “If our hearts do not condemn us, we have confidence before God and receive from Him anything we ask, because we obey His commands and do what pleases Him.” 1 John 3:21-22 NIV. Your needs are provided by the One described as, “. . Him who is able to do immeasurably more than all we ask or imagine, according to His power that is at work within us, to Him be glory in the church and in Christ Jesus throughout all generations, for ever and ever! Amen.” Ephesians 3:20-21 NIV. Today, I pray for you to trust your wants to His love and place your needs in His hands.